I've been finding recently that after a day of keyboarding, I sometimes get a sharp pain in my left wrist, especially when I try to rotate my hand counterclockwise. 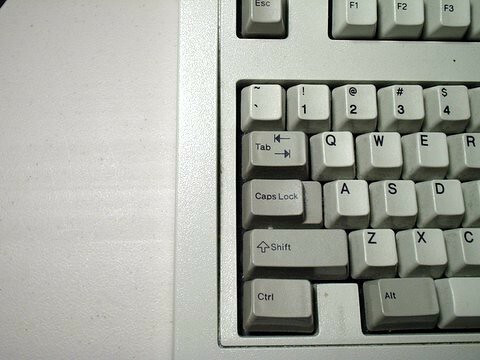 The most probable cause is that many software programs make frequent use of the Ctrl key (perhaps most notorious is the Emacs text editor -- there's even something called "Emacs Pinky Syndrome"). I didn't want to drop $600 on one of those luxurious Kinesis keyboards, and I didn't want to make my wrist worse, so in true Make Magazine spirit, I moved the keys around. There's a great free Windows utility called KeyTweak that lets me do this. Now the Shift and Ctrl keys are nice and high, alleviating the unnatural twisting you'd normally need to do to do a Ctrl+A, for instance. 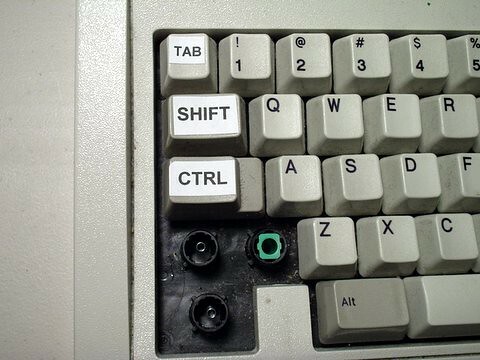 Update: To speed up the re-learning process, I have put some velcro on the Ctrl key to make it feel different. posted by Jonathan at 2/18/2005 12:21:00 a.m.